FT-IR is proving valuable in the analysis of materials during solid phase synthesis. It has the great advantage of being able to characterise reaction products without first cleaving them from the support. The principal aims are to confirm the identity of products and to determine the degree of completion of the reaction. Although virtually all the usual sampling techniques have been tried, direct transmission measurements have emerged as the preferred approach. These involve some form of compression cell as the pathlength through the original beads is too great. We describe a new cell designed specifically for these measurements. It can provide a controlled pathlength while eliminating the problem of interference fringes associated with windows made of a high refractive index material. The highest quality spectra are those obtained from single beads, but these require an IR microscope. For rapid routine measurements it is far simpler to look at a group of beads, and indeed this reduces any problems associated with bead-to-bead variation. However it introduces other problems resulting from non-uniform pathlengths and gaps between the individual beads. The impact of this on spectral quality will be discussed, with regard to both spectral subtraction and quantitation. We have developed software to monitor solid phase reactions from the spectra of compressed beads. This automatically generates the difference between spectra of beads before and after reaction, correcting for stray light and differences in pathlength. A database of IR band frequency correlations simplifies interpretation of the results. The principal advantage is that IR spectra can be obtained without cleaving compounds from their solid phase substrates. Although the spectra include a contribution from the support this often does not obscure the bands that characterise the compound of interest. There are two situations where IR spectra are most often used. One is simply to confirm that a reaction has proceeded as expected. The second is during method development, monitoring the degree of reaction in order to optimise reaction conditions. The measurement can be rapid, requires a very little sample, and is non-destructive, making this a very attractive technique. However obtaining any quantitative information is not straightforward. In general the aim is to determine the changes in relative band intensities as a reaction progresses. The requirements are therefore the same as for quantitative analysis or for good spectral subtraction. The samples consist of beads ranging in diameter from 50 to several hundred micrometers, too large for direct transmission measurements. However methods requiring no sample preparation are unsatisfactory. Reflection spectra are unsuitable because they give a varying mixture of surface and diffuse reflection where band intensities are not readily interpreted. In ATR spectra the problem is that imperfect contact between the beads and the crystal makes it difficult to obtain reproducible spectra. Transmission spectra can be obtained either by making KBr pellets or by direct measurements of compressed beads. Pivonka has shown excellent spectra from single beads that have been compressed after swelling with a solvent. However to measure a single bead requires an IR microscope. The solvent softens the bead so that it is readily compressed to a fixed pathlength. Here we describe measurements on clusters of beads that have been compressed without using any solvent. Contrary to some suggestions many beads can be compressed to a suitable thickness without shattering. However the resulting sample does not consist of a uniform film. At best it can be regarded as incomplete but otherwise uniform film. We show a typical cluster of compressed beads. Although virtually all the material can be compressed to uniform thickness there will be two sources of distortion in the spectrum. One is that some radiation passes through gaps where none will be absorbed. The other is that there will be a distribution of different effective pathlengths in the regions at the edges of the beads. However as can be seen the beads can be compressed to the point where these regions are only a small part of the sample. We have built a compression cell and matching beam condenser specifically for these samples. The cell has diamond windows with a clear aperture of 2mm. In earlier designs there have been problems from interference fringes caused by reflections between or within the windows. Our design minimises these fringes by avoiding parallel surfaces. 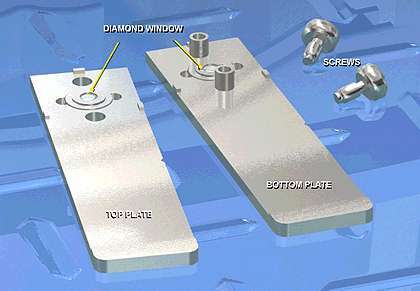 Sample preparation consists simply of placing a suitable quantity on one window, putting the two halves of the cell together, and tightening. Typical samples consist of fewer than a hundred beads, which readily form a single layer. The path length can be controlled by inserting metal foil spacers. Otherwise it depends on the quantity of sample and the pressure applied. The cell is designed to have a minimum path length of 25µm. The potential problems with the spectra are stray light, uncontrolled pathlength, and interference fringes. Stray light passing through the gaps in the sample distorts relative band intensities, reducing the apparent absorbance of stronger bands. This distortion is greatest for the most intense bands as can be seen from the plots in below. Although stray light can be kept below 5% by loading the sample cell very carefully, this requirement detracts from the simplicity and convenience that make the IR approach attractive. The gross errors introduced by gaps between the beads can be largely removed by a very simple procedure that is readily automated. This is based on the observation that the thickness of the samples is always sufficient for some bands to be totally absorbing. For example the polystyrene bands near 2920, 1450 and 700cm-1 can be regarded as having essentially zero transmission. An approximation to the stray light contribution can be obtained by constructing a smooth curve through the transmission values at these points. This is subtracted from the initial spectrum. The spectrum is then rescaled to restore the baseline level. This procedure is illustrated for a spectrum with approximately 50% stray light. Tentagel beads have suitable bands at 2900 and 1100cm-1. The procedure was applied to several spectra with different levels of stray light resulting from different amounts of the same material. If the original spectra are converted directly to absorbance the intensities of the polystyrene bands in the region 2000 – 1800cm-1 differ by a factor greater than 2.5. However after correction the intensities vary by only +/- 10%. Shown here are spectra of a cluster of beads in the compression cell, and of a single bead in the cluster measured in an IR microscope. After correcting for the 15% stray light the band intensities in the two spectra agree very well. The difference is dominated by interference fringes in the microscope spectrum, corresponding to a pathlength of 29µm. These fringes are not seen in the normal spectrum because there is a small angle between the windows. This angle is not large enough to avoid fringes when the aperture is restricted to the 80µm used in the microscope. In order to compare band intensities in different spectra it is important to correct for variations in pathlength. This can be done by normalising the intensities of bands that are common to all spectra. It is best to use relatively weak bands as these are least affected by stray light or differing pathlengths within the sample. For polystyrene beads the bands in the 2000 – 1800cm-1 region are very convenient. The spectra of Tentagel beads can be normalised on the aromatic C-H stretching bands around 3100 – 3000cm-1. These corrections were applied to data from hydrolysis of a sulphonic acid on Tentagel. This is not an easy example as the major sulphonic acid bands at 1250 – 1200 cm-1 overlap with other strong absorptions. The spectra were obtained at approximately 40 µm pathlength and showed up to 10% stray light. The true transmission at 1250cm-1 in some of these samples is only about 1%. After stray light correction and normalisation on the aromatic CH stretching bands the changes in band intensities are evident. By plotting the band intensities against time it can be seen that the reaction is 90% complete after one hour. The software is intended to simplify comparing spectra from beads at different stages of a reaction. It incorporates a routine that can correct for stray light automatically. The subtraction routine is designed to compensate for path differences by cancelling common bands. Two aids to spectral interpretation are provided. The user can specify functional groups associated with the starting material or expected product. The software then displays regions where characteristic bands occur. Alternatively the user can position a cursor over a band and the software will display a list of functional groups expected to absorb in that region. FT-IR is proving valuable in the analysis of materials during solid phase synthesis. It has the great advantage of being able to characterise reaction products without first cleaving them from the support. The principal aims are to confirm the identity of the incredibly small quantity of products and to determine the degree of completion of the reaction. Although virtually all the usual sampling techniques have been tried, direct transmission mir measurements have emerged as the preferred approach. These involve some form of compression cell as the pathlength through the original beads is too great. We have described a new cell designed specifically for these measurements. It can provide a controlled pathlength while eliminating the problem of interference fringes associated with windows made of a high refractive index material. The highest quality spectra are those obtained from single beads, but these require an IR microscope. For rapid routine measurements it is far simpler to look at a group of beads, and indeed this reduces any problems associated with bead-to-bead variation. However it introduces other well known problems resulting from non-uniform pathlengths and gaps between the individual beads. The impact of this on spectral quality have been discussed, with regard to both spectral subtraction and quantitation. We have developed software to monitor solid phase reactions from the spectra of compressed beads. This automatically generates the difference between spectra of beads before and after reaction, correcting for stray light and differences in pathlength. A database of IR band frequency correlations simplifies interpretation of the results. Fortunately these data bases are widely available.